We spent the second night of our annual trip to France in Rouen. Despite all the city’s other attractions, this meal was the prime reason for our stay. Some occasions are eagerly anticipated. Sometimes that anticipation is met and, with additional unexpected delights, exceeded. This was one of those occasions. Sylvie Tournadre greeted us and ushered us through to our table. The restaurant space is full of elegance and sophistication (as is Mme. Tournadre!). Materials and finish all suggest relaxation. A good mood is set for enjoyment and digestion. No view of the Seine through closed blinds in the evening but that means less distraction from what is about to happen inside. As a start we ordered champagne and reacquainted ourselves with Louis Roederer’s Brut Premier. Canapés came to accompany. Mini cauliflower tartlets which had a citrus, perhaps sumac, tang… I’m flapping already, aren’t I? A beetroot mousse was also lightly spiced. A cube of set Parmesan custard with bacon powder topping was a familiar friend which I really must make at home soon. 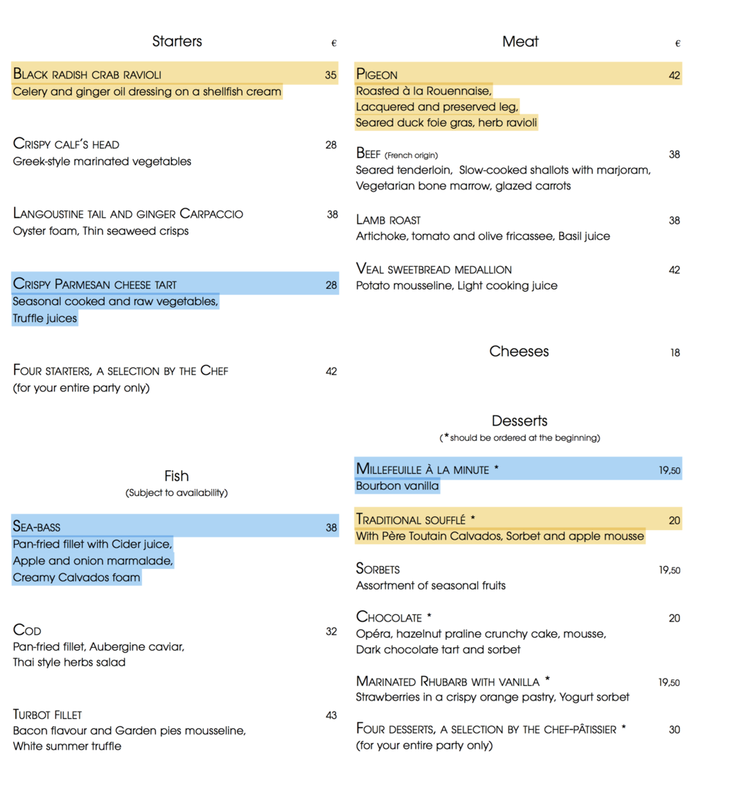 French and English language menus arrived and I cheekily pointed out a couple of improvements to the English text while ordering. Our six choices coincided with four of the ‘Spécialités’ listed by the Michelin Guide for this restaurant. Blue for Jan's choices. Yellow for mine. * Asterisks by dessert items signify that they should be ordered at the beginning. I still find that a quirky and mildly bemusing cultural trait in France. An amuse bouche of courgette mousse was light but was made more interesting with chestnut garnish. Jan’s Cheese Tart starter was the only thing which sat slightly uneasily amidst a succession of triumphs. Ingredients were fresh with cooked and raw vegetables giving texture but the baked disc of Parmesan crunch looked clumsy and made things awkward to eat. However, flavour was in abundance – so the prime objective was still met. The crab was in fact a cannelloni. That prompted one of my accuracy in translation interventions. Italian influence was taken over by that of the East… Chef loves Japanese cuisine. It actually had all the freshness of a Vietnamese Summer Roll. Whatever the influences, they took second place to flavours. Clean, delicate, sea-stroked crab was supported by lightly marinaded and dressed vegetables. The shellfish cream was held back but it still had enough intensity to complete a balanced, stunningly fresh dish. Just after our visit, Chef generously posted the recipe for this. Presentation on the night was even more careful and pleasing than his recipe photograph. The Sea Bass fillet was the most generous I’ve seen. Not the sort of thing you can get from a farmed product. Beautifully fresh fish took centre stage. The acidity and sweetness of apple and allium were in perfect balance. Sumptuous in flavour and texture. And yet, they still did not overpower the catch from the sea. My main was a more complicated dish. I always try to approach food at a slow enough pace to gain maximum appreciation. The pigeon stopped me completely in my tracks. The perfection of treatment is remembered as I write this and my eye is repeating the same tear of emotion as appeared at the meal. Foie gras had reduced to a liquid emulsion. The breast meat was so soft. This was the sort of experience which underlines how wide is the gulf between my own cooking and the perfection available elsewhere. A tiny confit leg was lacquered with five spice and provided a tender, sticky, meaty lollipop which disappeared all too quickly. Pan juices were in evidence but their flavours were already embedded in each mouthful. As you see, I did get that raviolo. Pasta was perhaps a little thick but it had the perfect amount of resistance needed before discovering the tender vegetable filling. Rhubarb 'soup' (more like a thin jelly) topped with apricot mousse came along as a pre-dessert. Just enough zing to clear our palates. This was a no-frills classic. Of course, the pastry had enough frills to plump up the petticoat of a 1950s jive dance skirt. All the lightness, paper-thin crunch and creaminess was finally overcome by the rich seduction of vanilla. Simple... and simply delicious. A decade ago the host at our Normandy holiday property recommended the speciality Calvados soufflé at a local restaurant. It was so poor that I’d not risked another since. This soufflé was generous fluffy egg. A wide spoon appeared and created a deep gap into which was poured more liquid distillation than I would have thought necessary. How silly that thought proved. Not usually a fan of heavy alcohol in dessert, here this slug of ardent traditionalism seemed wholly appropriate. I had more delight to contend with. The mousse was much closer to a sticky slab of pressed fruit but no worse for all that. Apples found further expression in the sorbet with its fruit and herb-driven smoothness. The herb was basil, by the way. Apple matchsticks sharpened up everything with a lime zest and citric acid hit. A proper sensation. It was fully worth that ten year wait to redress the balance. We've reached the point where I say that the coffee was good and that I was too excited to take enough notice of the mignardises to give them proper description here. Sommelier, Franck Barbay, deserves special mention as a lovely part of our memorable evening. I didn’t quite make him redundant in his main task but he didn’t argue when I spotted Yves Cuilleron’s Lieu-dit "Digue" 2015 Saint-Joseph on the wine list. It proved to be a successful choice. What made Franck stand out was his constant but never intrusive attention. I was able to see him reflected behind me working close to a ‘mis en place’ for wines. I know that he could not see me as his back was turned. But as soon as I shifted to take off my jacket Franck was magically at my shoulder to complete the operation. He certainly made me feel special but I know that he gave everyone else the same regard. He adds warmth and polish to the whole dining experience. It must be said that no-one else lets him down in that respect. There is a team effort here which ensures a seamless delivery of food, drink and hospitality. People who could stop short at doing a very good job instead turn into friends and create a feeling that you are the centre of a small universe, and, for a few hours at least, all is right in the world which you inhabit. We were here because of a recommendation from David and Helen Everitt-Matthias on their restaurant website. As we paid our bill we alerted Sylvie to this. She had no idea that ‘Gill’ had been highlighted in that fashion. As Gilles emerged from the kitchen she shared the information and her delight with him. Although visits from Cheltenham to Rouen are regular, Sylvie and Gilles have not been to ‘Le Champignon Sauvage’. This is explained by the support which they give to Sylvie’s parents in holiday time. Both in their eighties, they are winemakers from Bué in the Sancerre region. We had a lovely relaxed chat about the food we had just eaten, tried to give it the praise it deserved and left with a suggestion from our hosts that they are more determined to make the return trip to Gloucestershire now that their daughter is based in England. But we didn’t leave without collecting the bag brought with us. At the next corner we changed into its contents... more sensible footwear. At least one other dining couple admitted to the same plan as us that night. The walk uphill to our accommodation was dreamy and effortless.